Scottish salmon farming has grown steadily since the 1970’s and is now a major part of Scottish aquaculture, which has a present worth of over £1.8bn annually and provides more than 8,000 jobs. Scotland is the largest producer of farmed Atlantic salmon in the EU and the third largest in in the world after Norway and Chile. Where is your Scottish salmon from? Salmon begin their life in freshwater with wild adult salmon returning to their birthplace and swimming up rivers and streams to lay eggs, or ‘spawn’. This is replicated for farmed salmon in hatcheries, which in Scotland can be ‘flow through’ and based largely in lochs, or ‘recirculating’ and based on land. In all cases, eggs come from ‘broodstock’ which is predominantly from Norway. 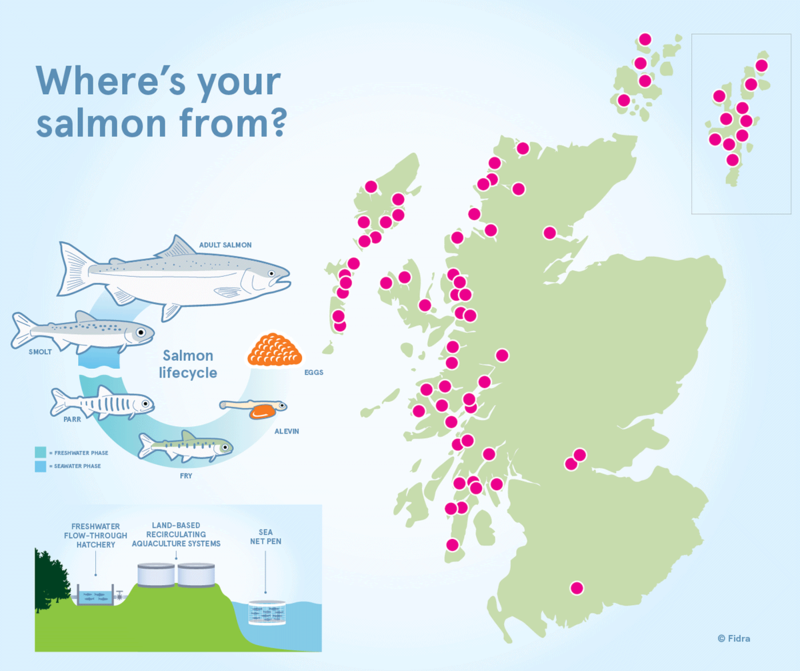 At present there are over 200 seawater sites licensed and producing farmed salmon in Scotland, and almost 100 freshwater sites. Of the seawater sites, approximately 30% are in Shetland, just over 20% in the Highlands, 20% in Strathclyde, just under 20% in the Western Isles, and approximately 10% in Orkney. The various stages of a young salmon are kept in decreasing densities in tanks or enclosures of increasing size, as the size of the fish increases. Scotland’s unique loch formation has led to many ‘flow-through’ freshwater hatcheries. Once at the smolt stage, salmon are transferred to seawater sites. In Scotland, most of the seawater sites are open net pens in coastal areas as shown.